Bocharov, M. A., Davidenko, I. V. & Polevanov, V. P. (2008) Baikal: the world strategic source of potable water [Baikal: mirovoi strategichesky istochnik pitievoi vody]. Promyshlennye vedomosti. vol.3-4. Didenkov, Yu. N., Bychinsky, V. A. & Lomonosov, I. S. (2006) The possible existence of an endogenous source of fresh water in rift settings. Geology and geophisics. vol. 47, no. 10, pp. 1114-1118. Ginsburg, G.D., Soloviev, V.A. (1994) Submarine gas hydrate. Saint Petersburg: VNIIOkeanologii. Kalmichkov, G.V., Egorov, A.V., Kuzmin, M.I. et al. (2006). Genetic types of the Lake Baikal methane. Reports of the Academy of Sciences. vol. 411, no. 5, pp.1-4. Khlystov, O. M., Zemskaya, T. I. & Sitnikova, T. Ya. (2009) Bottom bituminous constructions and biota inhabiting them, according to investigation of Lake Baikal with the MIR submersible. Reports of the Academy of Sciences. vol. 428, no. 5, pp. 1-4.
hydrates in the surface layer of deep water sediments of Lake Baikal [Gidraty metana v poverkhnostnom sloe glubokovodnykh osadkov ozera Baikal]. Reports of the Academy of Sciences. vol. 393, no. 6, pp. 822-826. Kondratov, A. M. (1978) The Address – Lemuria? [Adres Lemuria?]. Leningrad: Gidrometeoizdat. Kontorovich, A.E., Kashirtsev, V.A., Moskvin, V.I. et al. (2007) Petroleum potential of Baikal deposits. Geology and geophysics. vol. 48, no. 12, pp. 1346-1356. Lobatskaya, R.M., Mats, V.D., Auzina, L.I., Shilenkiv, V.G., Lishtva, A.G. (2008) Field Practice on Baikal. Geography, Geology, Zoology, Botany: school book. Irkutsk: IrSTU. Pogodaeva, T.V., Zemskaya, T.I., Golobokova, L.P. et al. (2007). Chemical composition of pore waters of bottom sediments in different Baikal basins. Geology and geophysics. vol. 48, no. 11, pp. 1144-1160. 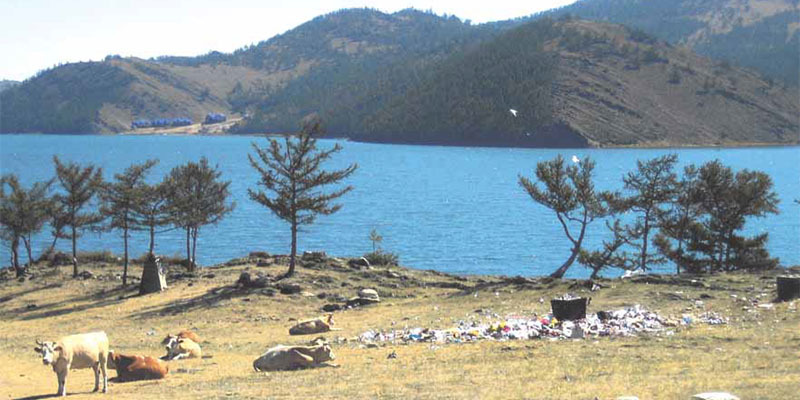 Report on the state of Lake Baikal and measures for its protection in 2011 [Gosudarstvennyi doklad o sostoyanii ozera Baikal i merakh po ego okhrane v 2011 godu] (2011). Moscow: Ministerstvo prirodnykh resursov i ekologii RF. AUZINA, Larisa. Baikal is ‘a Rich Lake’ (translated from Turkic). project baikal, Russian Federation, n. 37-38, p. 76-83, sep. 2013. ISSN 2309-3072. Available at: <http://projectbaikal.com/index.php/pb/article/view/570>. Date accessed: 23 apr. 2019. doi: https://doi.org/10.7480/projectbaikal.37-38.570.